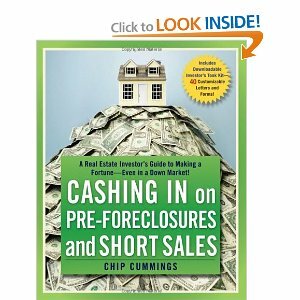 "Cashing in on Pre-foreclosures and Short Sales" offers investors and inside look on exactly how to maneuver the murky waters of foreclosures. Pre-foreclosures and short sales are great ways to make money, even to help current homeowners that may be struggling with the turn of the economy. For a good foot holding, there are some basics to become familiar with. Author, Chip Cummings, hands you these basis tools. Distinguishing the difference between good and bad deals and how to find, evaluate, and obtain foreclosure properties are two major tools Cummings discusses. Properly and profitably negotiating a transaction, and the power of short sales (and other strategies) are among the other tools Cummings hands over. Cummings' information can give even first-time buyers the competence and confidence to pursue a profitable deal. The book utilizes advise and quotes from professionals in the real estate industry, an appendix that includes state and national foreclosure guidelines, contacts, websites, sample forms, checklists, and all the necessary tools o find, evaluate, secure and profit from foreclosure properties. If this weren't enough, Cummings teaches, a better understanding of all the steps in the foreclosure process, how to develop an investing strategy that will be effective and profitable, how to navigate your way through state foreclosure laws and regulations, some creative financing solutions and how to use them, the best way to locate and evaluate properties, how to avoid investment schemes, frauds and the mistakes that newcomers can easily make and much, much more.